Paul Helberg was born in Hamburg on the 24th April 1905. He moved to Leipzig where he trained as a typographer. He was active in the Anarcho-Syndicalist Youth (SAJD) and the FAUD. He met his future wife Gees, a Dutch woman, at an international anarchist youth gathering in Leipzig. They were married in 1930 and Gees moved to Germany, where she joined the Communist Party (KPD) in 1932. Paul’s skills meant that he printed much FAUD material. In February 1929 he set up a FAUD printshop with Arthur and Martha Lewin, also FAUD members. When the FAUD was forced to go underground with the Nazi rise to power in 1933 the printshop was maintained and used to publish clandestine FAUD literature. The Gestapo uncovered the underground printshop and Paul and Gees were arrested on June 17th 1933 and Paul was imprisoned in the Börgermoor concentration camp until November 1934, whilst Gees was in “protective custody” from July to September 1933. 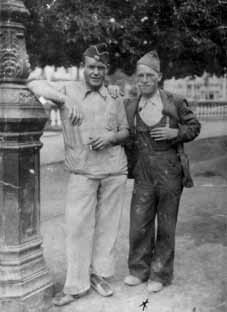 After their release they continued their resistance work but in September 1936 fled to Spain via Holland, crossing the border at Aachen and then moving from Lille to Paris and then to Barcelona. There Paul joined the Deutsche Anarcho-Syndikalisten- German Anarcho-Syndicalists (DAS) who worked alongside the CNT. With the Spanish Revolution, Paul joined the International Group of the Durruti Column with other German anarchists. Returning from the front he worked with Willi Winkelmann for a Swiss transport firm in Barcelona. Paul returned to the front in April 1937 in the Battalion de Muerte (Death Battalion). This group, consisting mostly of Italians, had been initiated by Diego Abad de Santillan, and was considered as a crack unit. Paul served in it with Ernst Galanty (real name Isidor Klappholz), Karl Brauner and other German anarchists. It was deployed on the Aragon front in June of that year. It was given the order to attack. It numbered 900 men yet had only 150 rifles and the Battalion was told to capture rifles from the Francoists! This was a ploy by the Communist-dominated army leadership to wipe out the anarchists. A commander who refused orders was sentenced to death, whilst Paul, Brauner and Galanty were sentenced to twenty years hard labour! They were imprisoned in the Cartena prison from where Brauner and Galanty and then Helberg managed to escape. Gees had returned to the Netherlands in April 1938, and Paul followed her there in February/March 1939. He was arrested on 20th November 1939 and imprisoned on the Frisian island of Vlieland. After the Nazi invasion he was transferred to Dusseldorf on June 6th 1940. Finally released from prison, he was forced to join the Wehrmacht. He managed to escape in France at the end of 1944 and then went into hiding in Wuppertal with the family of Fritz Dickel, a Communist who later became interior minister of the GDR. At the end of the war he returned to Leipzig. His old comrades who had made it to Sweden renewed contact with him. However he replied by sending official documents from the East German Communist Party, the SED, which he had joined. He received a leading position at the Leipziger Volkszeitung newspaper. He was not the only surviving Leipzig FAUD-er who took this course. The East German state recognised them as anti-fascist fighters and their membership of the FAUD was credited to them later as party affiliation, for special payments on top of their pensions. He died on 28th April 1989.